- How can I help? 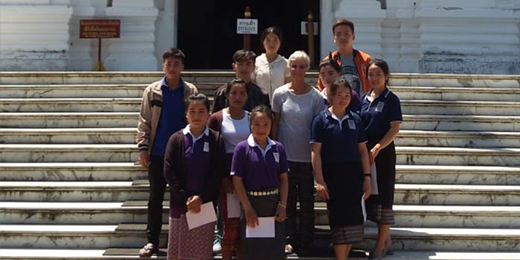 At the end of the school year, a small group of LEOT students made an afternoon visit in June to the Museum, formerly the Royal Palace in Luang Prabang. The students were accompanied by Ajan (teacher) Phet and Clare who is a regular volunteer at our school. They took a great interest in all that they saw and were keen to find the information needed to answer the questions on their worksheet. The museum is always a popular place to visit, as many of our students have come from villages scattered throughout northern Laos and have never before had the opportunity to visit this grand old building and find out about its history. UK Registered Charity Number: 1115944 Copyright LEOT (Lao Educational Opportunities Trust), Registered 2006.